we started at 11:30 am to easy 35 km . it was quite cold, 31 degrees ;-). 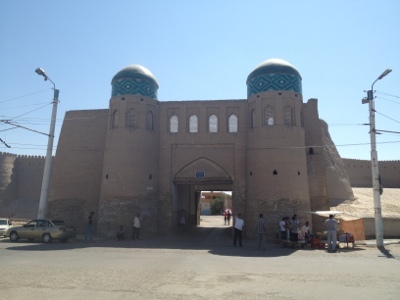 after two hours of cycling (avs 18,8) we arrived in Khiva. we had the option to stay at a new hotel with 80 USD per night but we found a small and beautiful one in front of the old citywall. 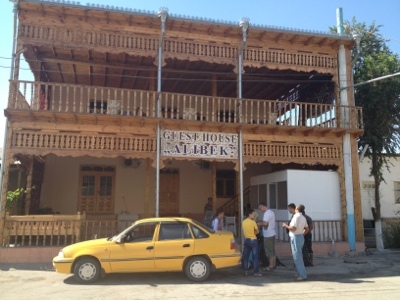 the Hotel "Alibek" is run by a very friendly family and some of them speak English fluently. some globetrotters from Europe stay here, too. the atmosphere is more familiar than in the business hotels and it is, by the way, cheaper. 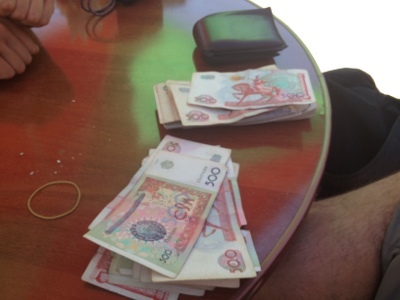 the Uzbekistan currency is Som. 1 Eur are usually 3000 Som but it depends on the exchange rate on the "free" market; changing in a bank or hotel is not recommended. you can imagine that you have to carry tons of notes with you for a small amount. paying with US Dollars is better. world and told us many stories, too. 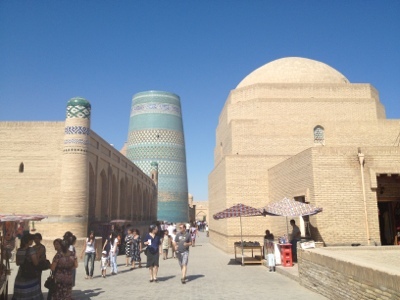 then a video show started, which gave more information about Khiva and the region. what a funny end of this day! we had a small but delicious breakfast and then went to the old city. what a beautiful and very old city!! 2500 years old !! amazing! after a small lunch at a lovely restaurant we went back to our hotel. three German guys had some tea, Axel from Karlsruhe and Christoph from Berlin, on holiday, but working for Air Berlin; Thomas joined us a little bit later. a very funny afternoon due to the fact that Axel knows a former collegue of me:-). 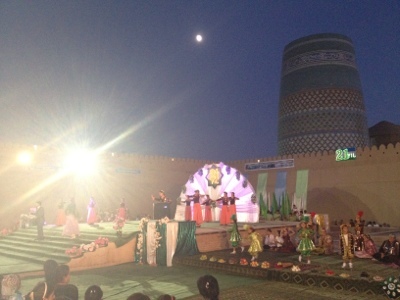 in the we visited the preview of the celenrations for the 21st anniversary of the Republic of Uzbekistan. a beautiful show ! the Silk Road. 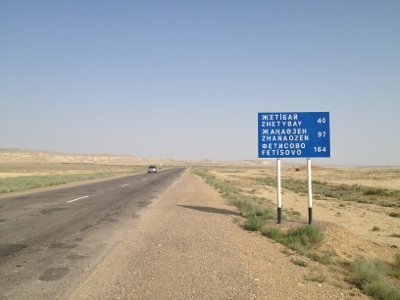 it is 300 km and perhaps we go by autostop again, otherwise we would not have the possibility to visit it there and in Samarkand. so long ! 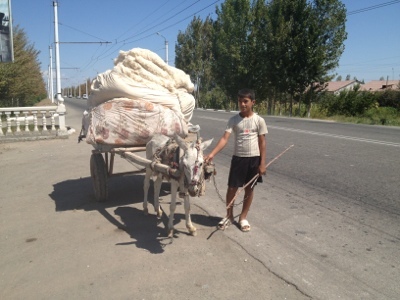 picture with donkey: the local "donkey-express" transporting fresh harvested cotton. immigration officer noticed us and we had a personal service. so friendly !! they checked the passports and showed us a form that we had to fill out. well we heard some bad stories about this procedure but no problems at all. they wanted to know something about weapons, medicines, electrical devices, books and plants, we filled it out, a well English speaking immigration officer checked and stamped it. no x-rays for our bags. another officer pressed a little bit our bags, but nothing more! was a very friendly atmosphere and we were wellcome. at 1:30 we slepted behind the border on a big parking area, knowing that Ivan is still behind the border. our stuff in the boxes below the truck. Usbekistan we are coming ! 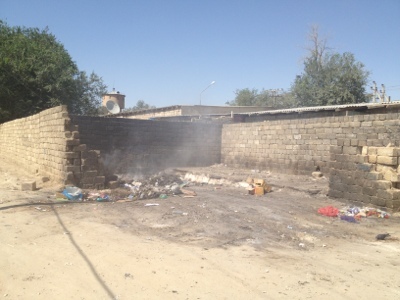 after 300km and a very bad road we arrived Qonghirat (Kungrat) at a truck stop. this city was totaly different to the last towns: green plants, trees and friendly people. we had a delicious meal and washed us in the bathroom. good to be clean after the sand, wind and sweat. 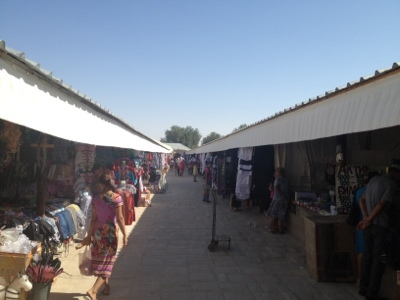 we drove over Nukus to another small truck stop. Ivan slepted in his truck and we in our tent. 500 km on this day. we got up at 7 am head a small breakfast with Ivan and started to our last section with him. he let us of close to Beruni. we were really sad that we had to say Goodbye ! Ivan was so friendly and we had so much fun with him, we miss him !! all the best to you and we keep in touch !!! 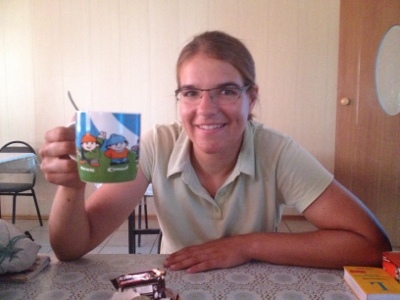 after 55 km (3h 8, avs 17,5, total 4853, truck 560) and many friendly people in a green landscape we arrived in Urgench. on our trip we noticed many fields with cotton plants, the water comes from the lake Aral, a total desaster for this lake ( which is also in KAZ). a sin from the former USSR government. water is life and it is necessary that you have to seen the desert to understand it. the lake Aral is an enviromental desaster for the people there and for the climate. Urgench is a quite beautiful city with many banks,much better than expected. 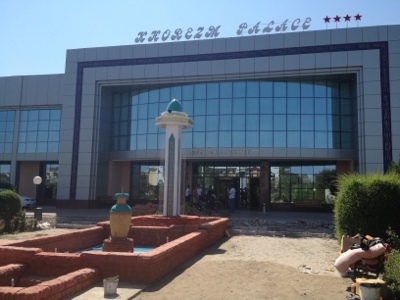 we searched the hotel Khorzem Palace, which has Wifi ;-). 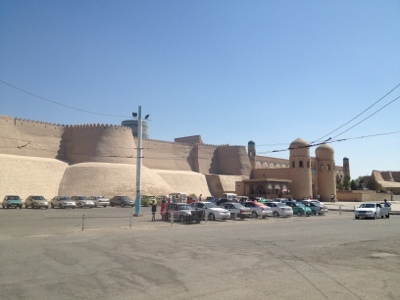 tomorrow we will cycle to Khiva. we started at 7am and had the bad road again. no tears for this strange town. much better than Shetpe, but no reason to stay longer than necessary. a Turkish trucker donated us some energy drinks and a cold EFES beer; what a delicious drink in the heat :-). after 50km and tail wind we camped early in the afternoon. this day was really crazy! heavy tail wind with sand. it pushed us up to smaller hills. never had such a wind before! we stopped in a small town with a railway station. well, living in this nasty village is horror. only a small shop, nothing else. for children no good place to grow up.some women at the railway station were selling vegetables so we bought some and had a snack in front of the shop. 10 km before the border we looked for a place to camp. we had the plan to cross the border early in the next morning. no funny thing. wind and wind and wind. we were sand-blasted. suddenly a truck stopped. Ivan from Kiew in a Czech truck, transporting frozen food from Germersheim (Germany) to Massar-el-Sharif in Afghanistan to the German Army (Bundeswehr). we had coffee in his truck and he asked us to take us with to Buchara. he spoke a little bit German so it was easy to communicate. 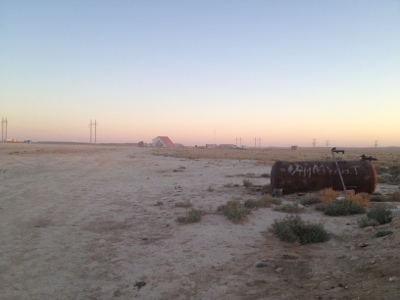 well,we decided to cross the border at midnight, waiting at the UZ-border for him, entering his truck at 5 a.m. and traveling with him till Beruni, close to Khivas, the old silk-road-city. total kilometers in UZ are for us over 1600 km within 30 days. this means every day over 60km, no time for sightseeing... not our attitude, because we want to see Buchara and Samarkand, too. we arrived at the border at 6pm and cooked some noodles. Ivan already arrived and we had a smalltalk. we slepped in our sleeping bags for two hours and at midnight we left KAZ. 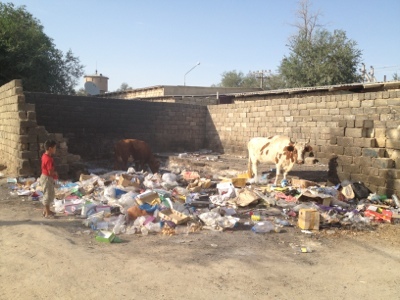 no tears, we hope that North-Kazachstan is much better, the south-east (without Aktau) is horrible. looking for lunch. unfriendly person at a Helios gaz station . we had lunch at a small restaurant. two men invited us for tea. the conversation was not funny. they always wanted to know the price of our bikes and then mentioned Hitler several times. it was time to leave this place. 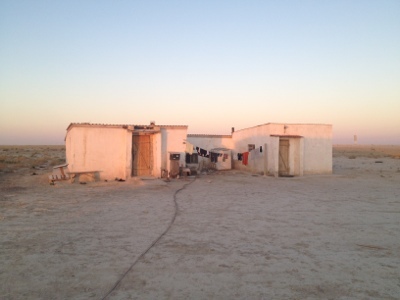 we camped close to the oil fields with scorpions in the next morning under my tent. it was the same boring and bad way as the last days. after 47 km within 4 hours , we stopped at street without any shadow. this makes no fun. then I had again a flat tyre :-( first time at all I had pain in the left leg. at a small restaurant we had some potatoes with meat, for me two beers from KAZ. we were allowed to built out tent on the terrace. 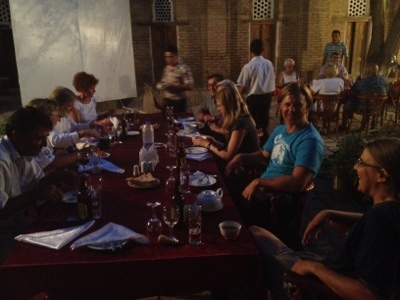 a truckdriver from Belarus and one from KAZ invited us for a second dinner. my russian is very poor. if I understood him correctly, so he always transports overweight women to Turkmenistan. strange world ;-). Astrid and me repaired the bicycle of the son from the owner of the restaurant. we started at 9:30 to Shetpe. only 18 km. on oure way a car from Caspicement a branch of Heidelcement stopped(Heidelberger Cement Company) and we had a short small talk. 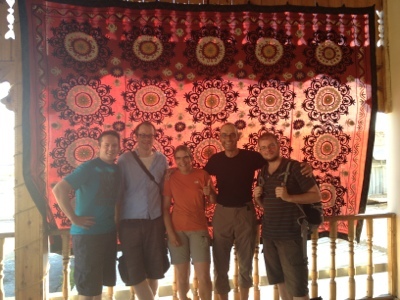 at 12 we arrived at a small guesthouse glad to relax for one and a half day before going on our tough trip. temperatur 43Celsius. in Shetpe we found a hostel with a room without AC but with shower . the only hostel but we were glad to spend two nights there. the woman was, wgat else, unfriendly and only interested in our money. we noticed a washing machine and asked for using it. she told us that it is broken. the next day she was using it..... .
well, Shetpe is an ugly village in the desert and most of the people are unfriendly. we were indeed strangers and not guests. this behaviour seems to be common in this region , laughing or smiling seems to be against a law. only the behaviour of young lady from the restaurant was over the average .. we bought some food and relaxed ourselves after three heavy days, knowing that the desert with a gravelled road expects us. 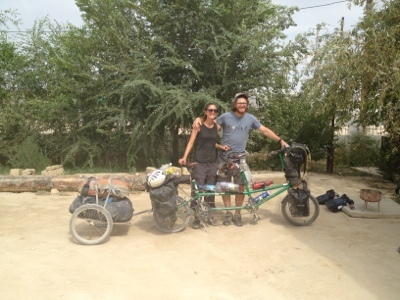 still in Shetpe and we checked our bikes, because Astrid's bike made a strange sound. 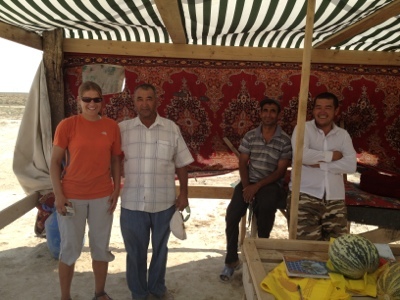 we met a french couple in their 25-years-old Renault driving to Kirgistan. we started early but a little bit too late to Beyneu. until today this day was the hardest one on our trip. we cycled 71km on a bad road, which is used by big trucks as well. a gravelled road with sand and stones and high temperature up to 45degrees. high concentration was necessary. another flat tube stopped our trip for half an hour . good possibilty for Astrid to recover herself. she has big problems with the heat. 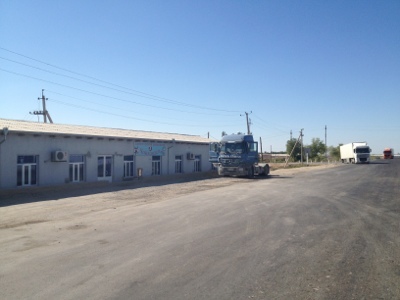 a truckdriver gave us a bottle of water and told us that in 25 kilometers there is small restaurant. 25 km are no fun on this road. but to have the safety to get water we tried to arrive at this small village. We arrived there in the late afternoon. after a good possibility to wash ourselves, and a simple dinner Astrid went to bed. she was extremely exhausted. during the night Astrid had big problems with her stomach. in the morning she was not able to cycle. we decided not to travel on this day. she slepted the whole day. 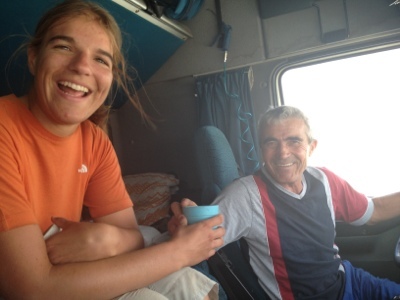 another cyclist from France bought some water and we had a short conversation. 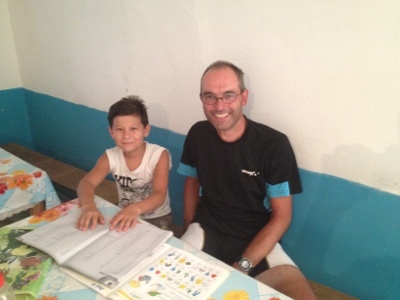 I wrote my diary and supported Amandeli, the 12 years old son of the owner, learning English. 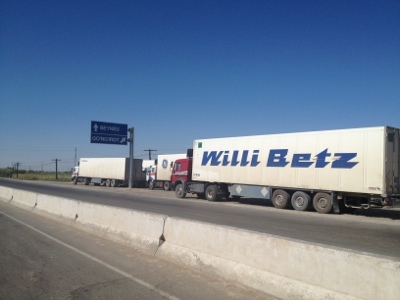 during the day several truck drivers from Turkey Russia or Romania came to the small roadhouse . 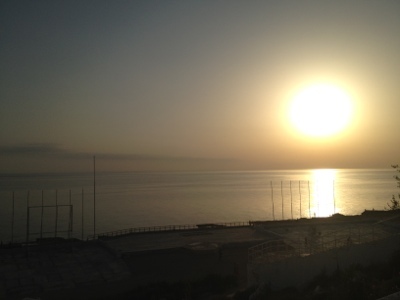 in the evening seven trucks which were on the same ferry "Karabach" arrived. 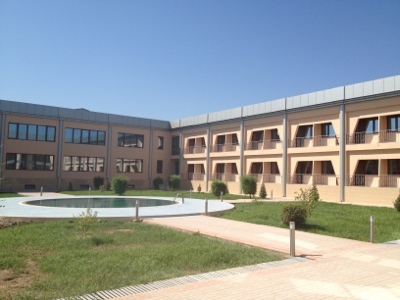 one of the five Turkish trucker lived for twenty years in Ulm, spoke German fluently and transported special goods from Germersheim (Germany, close to Mannheim) to the NATO in Afghanistan... what a crazy meeting in the desert of KAZ. this day, were unfriendly and arrogant. if you greet the Russian truckdrivers no response. a group of Russian motocyclist in a small restaurant: no hello. we got an invitation for a small house from a farmer close to this restaurant; see video. we got up at 4:30 and wanted to start as early as possible but suddenly a sound from the young dog from the farmer stopped us. he had locked this small dog in his "bathroom". no light too hot and no water. what a idiot! we gave it some water and bread and let the door open. I had some problems with diarrhoe. we started at seven and it was a bad road again. some Turkish truckdriver gave us water and juice. after 33 km we stopped for a short sleep in the shadow of an old gazstation. after 39 km we finished our trip for this day and had lunch at a small truckstop. I felt not very good so we asked at the local guesthouse for a room. what an unfriendly person! we were again strangers and not guests. it seems that people in the countryside are usually unfriendly, with low IQ and low education. their lessons in history about Germany stopped with WW II, because everyday somebody named Hitler. real boring. and three friendly (!) men wanted to know all about us. they offered us water and gave me a beer. they were obviously much more well educated as the rest of this district because one of them tried to speak a little bit English. with our poor Russian language his English we had a funny conversation. we spend the night in a very hot room there. I am now travelling for four month. 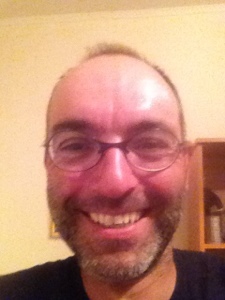 I cycled 4653 km, 170 km autostop by trucks in Turkey, 1100km by train from Ankara to Kars in Turkey and 200 km by train from Kuerdemir to Baku in AZ. second ! we do not have fun every day, especially this tough section now in KAZ, very hot, bad road, dust, boring landscape and unfriendly people, but this is real life and adventure. I can not imagine any more to sit in an office, creating dubious balance sheets by order, silly excel sheets and boring presentations with powerpoint; then discussing these fairy tales with a chief executive officer or managing director who do not understand anything from correct accounting or controlling. I am free as a bird:-). 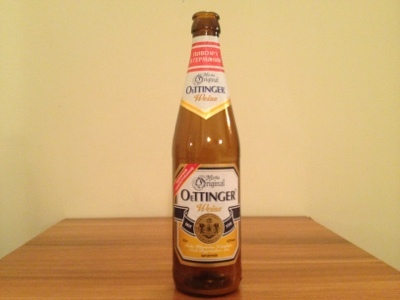 it works very well with Astrid, sometimes we have a different opinion but we always find a compromise. this day we cycled 44km, 3h 47, avs 11,7. we crossed a bridge and noticed a small river. two men with rifles were walking under the bridge. they were friendly but we decided not to camp there. I do not want to have any discussions during the night with armoured persons. 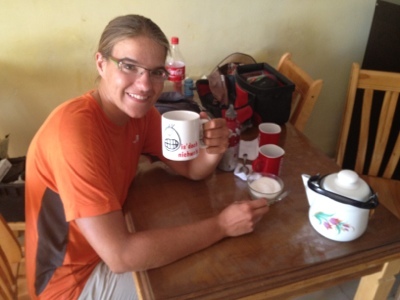 we stayed in a small restaurant, we had some rice, eggs and tea and did our documentation. the family of the restaurant was very friendly. we were guests and not only strangers. 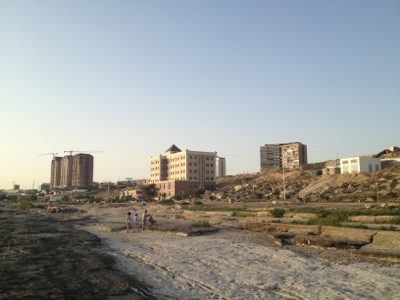 tomorrow, after 45 km, we will arrive in Beyneu where we will stay for 4 or 5 days. this is our last bigger city before Uzbekistan; our visa for this country starts on the 24th of August. we cycled on asphalt. yippieh !! well, 15 km before Beyneu: road construction; the same again. 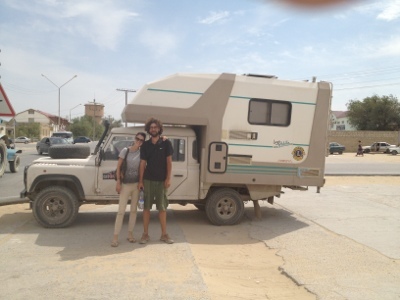 we looked like pigs, just having a bath in the dust.as we arrived in Beyneu, we met Manuel and Wiebke from Germany, backpacking from Beyneu to Aktau. hope we keep in touch! it was now 1pm and very hot. time to look for a hotel or guesthouse for the next six nights. we had luck, in the third one we checked , Michael, the French cyclist, stayed there, too. he helped us to get a comfortable room with a discount, because the woman, was not very cooperative and friendly (what else...). sleeping and more than three hours in the internet cafe just over the street. 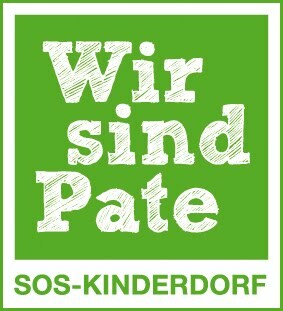 we got the information, that two and four weeks ago there have been two different groups of cyclists from Germany which wanted to cycle the same bad road but had to take the train or switched to autostop due to health problems. so we were glad not to have these bigger problems on this section and we are a little bit proud for passing this challenge. sleeping and cleaning the bikes. sleeping and making our documentation. in the afternoon I went to the local hairstylist to cut my very long hair. he was very friendly and now I look like a globetrotter and not like Catweazle ;-) after this urgent event I repaired two tubes. more angry. never had such a bad experience on our trip like here. honestly I am glad to leave this country in three days and I hope that in UZ the behaviour of the people will be better. we got up quite early to do our laundry, expecting that tap water will be not available for hours. we did some shopping and noticed a tandem bicycle in front of a cafe. great meeting in the afternoon: Ash and Laura from Australia, cycling from London to Down Under and another couple from France coming from Mongolia on their way back home by camper van. after some cups of tea we showed the Aussies the biggest supermarket in town. hope we met them again because they have the same way as us. they want to cross the border to UZ on the 25th of August. tomorrow we are on our way to UZ. it will take to days. now packing our bags, having dinner and we have to go to bed quite early. we want to get up at 4.30 am. so long ! 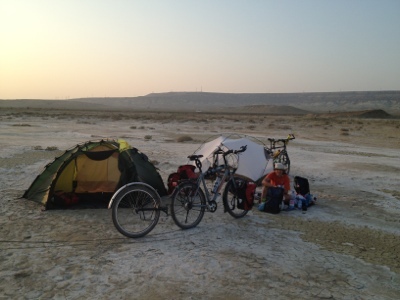 after a small breakfast at our "campingsite" we cycled to Aktau. unfortunetly a flat tyre stopped us for half an hour. 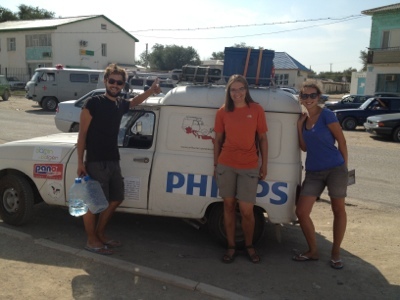 we arrived in the east of Aktau and decided to go first to the International SOS hospital to check Astrids hand. after this we would look for a hotel. Microdistrict 26? where should it be ? a very friendly guy explained and draw us the way. 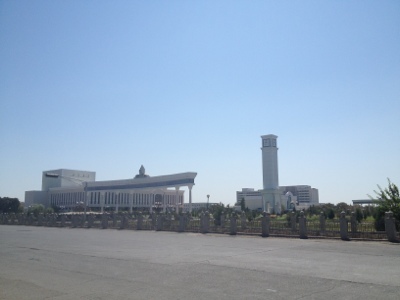 by accident, we noticed the Hotel Silk Way which was on our list. 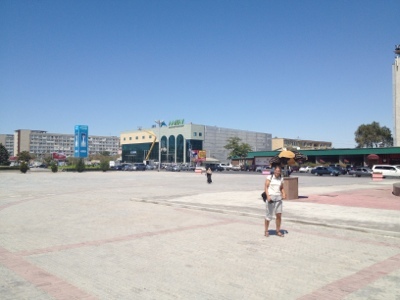 the price for an expensive Aktau was ok and our bikes were safe. so no reason to hesitate. the breakfast in this hotel is very delicious. after this we went to the local public hospital for removing the stitches at Astrids hand and knee. 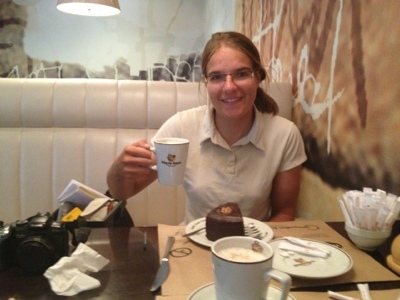 after 20 minutes and for the price of 2000 Tenge (11 Eur) we went to the Guns&Roses Coffee bar and had a delicious cake and cappuchino. it was 2:30 pm and we decided to go to the migration police for registration. this was not funny! they wanted to decrease our 90-day-private- visa down to 10 days, because our visa-agency in Germany did not give us an invitation for KAZ; our visa for Usbekistan will start on the 24th of August. so an extreme serious situation. in the worst case we would have to leave KAZ at the 11th of August. Fortunetly we met Nyssanbay, who worked for Freudenberg Oil&Gaz, (German company, HQ in Weinheim), and he speaks German fluently. 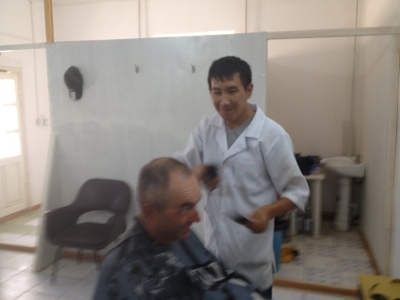 he made the translations and pushed the policemen to give us a tourist visa. after four hours of waiting we got it ! great job, Nyssanbay and thanks a million!! what should be organized.... so we are happy if we have the possibility to do nothing. after breakfast we made our documentation. sleeping and recovering. we bought some food for tomorrow and packed our bags. 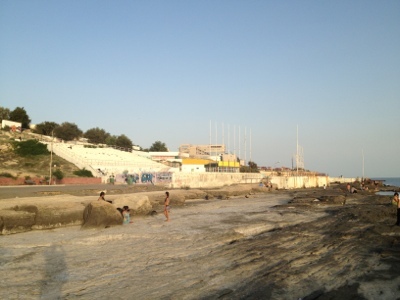 Astrid was swimming in the Kaspian Sea but it was very cold. 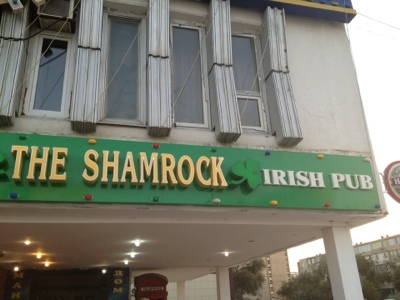 dinner than in "The Shamrock - Irish Pub". 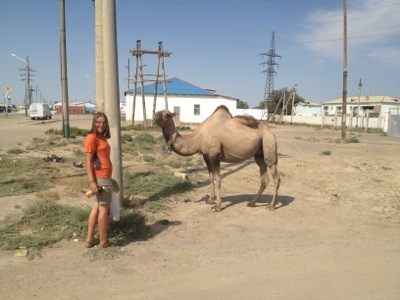 today we will leave Aktau in direction to Shetpe and Benyeu... big challange! friendly and helpful staff. 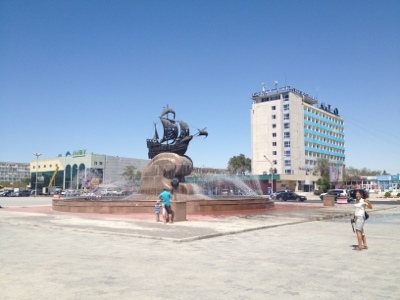 for Aktau is big room for improvement.its founded in the beginning fifties of the last century and should have money due to the port and raw materials, but many building really should be painted or redeveloped .the sidewalks are dangerous. you always have to watch your step, big holes and silly constructed stairs can make you fall.